No games were played in the Nigeria Premier League 2010-2011 between 13.03.2011 and 11.05.2011. In the meantime, the different clubs have bought and sold several players. Below is my unofficial list of confirmed transfers. I have also written down transfers who have reportedly taken place, but that needs to be confirmed. If anyone notice any mistakes or know of other transfers, please let me know. This post will be updated frequently, as I am expecting to find a lot of information about transfers during the next couple of weeks. The picture is of Kingsley Salami (in yellow shirt), the new midfield general of Heartland FC who was signed from Bukola Babes FC. 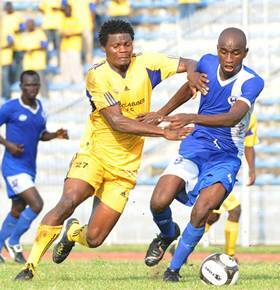 Several reports suggested that Philip Asuquo of Crown FC had joined Sunshine Stars FC. It can now be confirmed that Asuquo, the talented midfielder, is still at Crown FC. Several reports suggested that the brilliant winger Effiom Otu Bassey of Bukola Babes FC would leave the club. It can now be confirmed that Bassey is still at Bukola Babes FC.